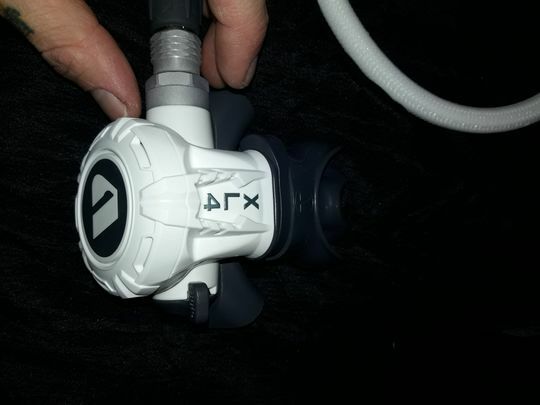 The Apeks XL4+ Regulator is a white version of the popular, compact, cold water XL4 Regulator. With one small adjustment, a second HP Port, the XL4 Plus is more practical for divers who want to use an analogue gauge and a wireless transmitter. Who is the XL4+ For? The XL4 + is tested for cold water while keeping lightweight for travelling divers. A small 2nd stage is perfect for longer dives to reduce jaw fatigue and reduce bulk on a stage cylinder. The XL4+ is perfect for divers who want a regulator they can use in cold waters that isn't heavy so they can use it as a holiday regulator too. Any Apeks Octo is compatible with the XL4+ but the XL4 Octo is best if you're looking to build a single cylinder setup. Any LP Inflator Hose will fit the XL4 and Apeks' Tech Gauge and Hose is the perfect SPG for a single cylinder set. White flexible nylon braided hose has better cold water performance than traditional rubber hose. i know it is not relevant for the matter, but it is also beautiful. the colors and the overall feeling of the smooth surface of the regulator.